Another great day out in the field today as we explore Big Sisters' Island. As soon as we started, Ria found a pair of Tiger-tail seahorse (Hippocampus comes). They stayed very still for us to take turns to photograph them before moving somewhere else when the water level got too low. Here's a video of the seahorse during the outgoing tide. A reef octopus came out to say "Hi" to me before scrambling into hiding. 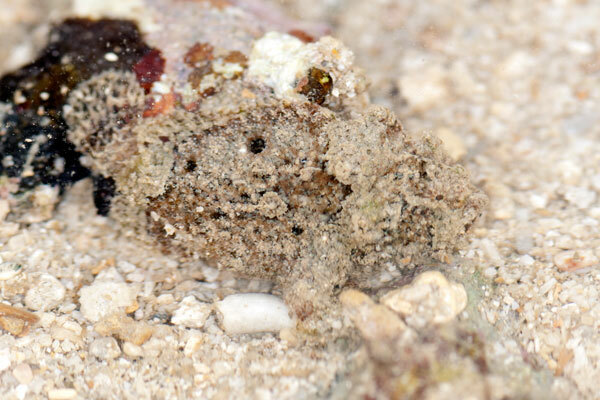 It is not easy to spot a reef octopus as they can blend into the surroundings very well. 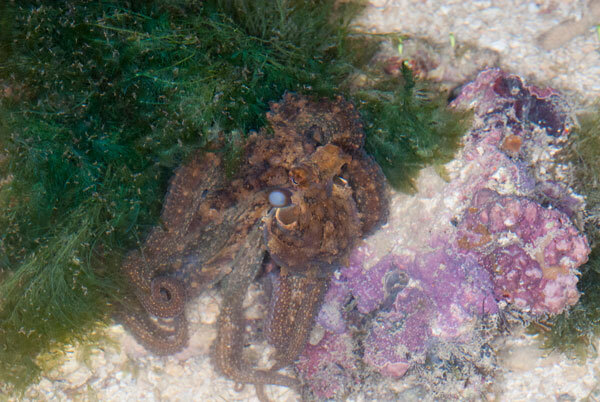 Most of the time, we spot the reef octopus when they are moving about. 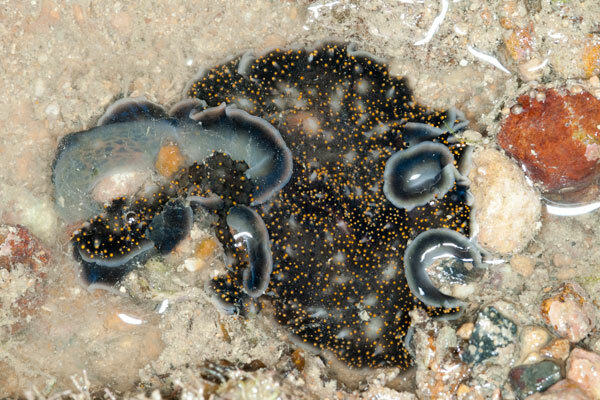 There were a few flatworms spotted seen, such as the Spotted black flatworm (Acanthozoon sp.) 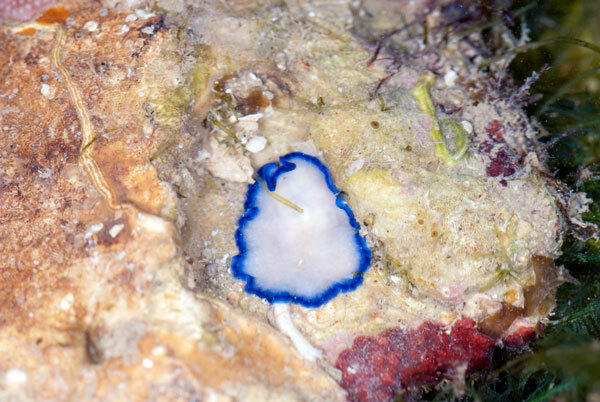 and the Blue-spotted flatworm (cf Pseudoceros indicus). Flatworms are very delicate marine animals and their body tears easily if mishandled. So it is best to just leave the flatworms alone. The commonly seen phyllid nudibranchs in various colours and patterns were seen too. 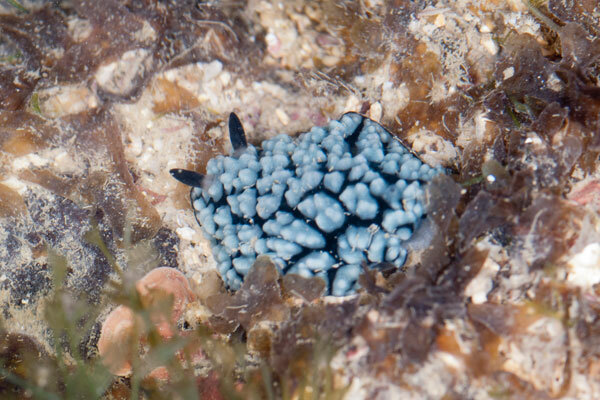 In this trip, I saw the Black phyllid nudibranch (Phyllidiella nigra) and the Pimply phyllid nudibranch (Phyllidiella pustulosa). 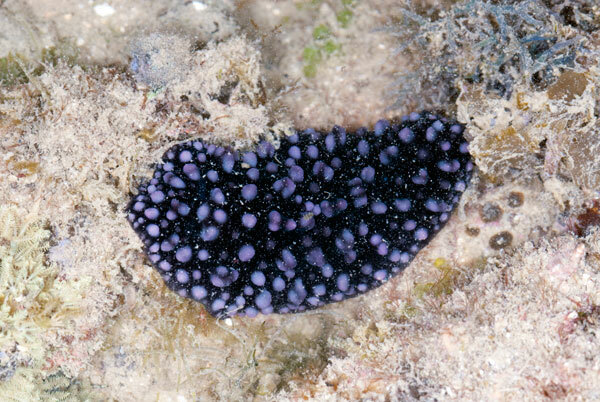 The other sea slug seen would be the Black-margined nudibranch (Glossodoris atromarginata). There were a few spotted today. 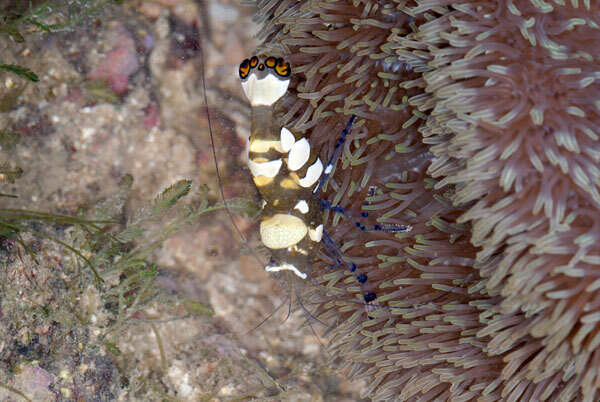 At the only Giant carpet anemone (Stichodactyla gigantea) that I saw, I could not find any wriggling signs of the False clown anemonefish's (Amphiprion ocellaris) presence but I did find the Five-spot anemone shrimps (Periclimines brevicarpalis). 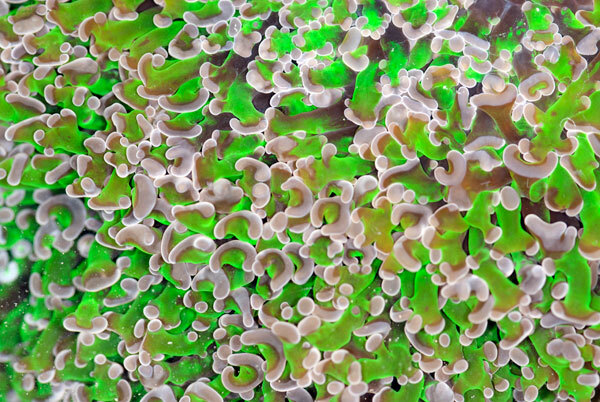 I find the Brain anchor coral (Euphyllia ancora) interesting. It is a hard coral with long polyp tentacles, each with a U-shaped tip. You will not be able to tell that this is a hard coral when the polyps are fullt extended. 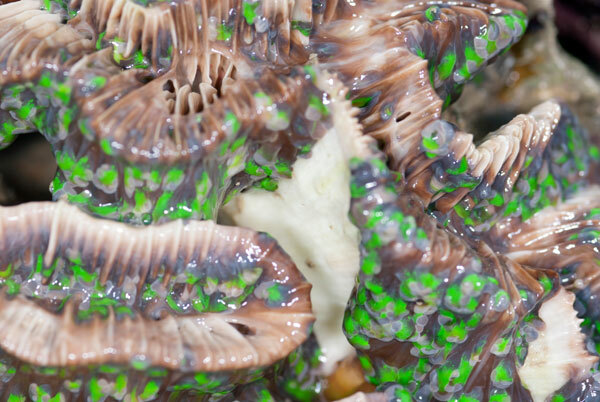 However at low tide, part of the coral is exposed and the polyps retract, exposing the branching corallites with deep valleys between corallites. Brain anchor coral, with polyps extended. Brain anchor coral, with corallites exposed and polyps retracted. 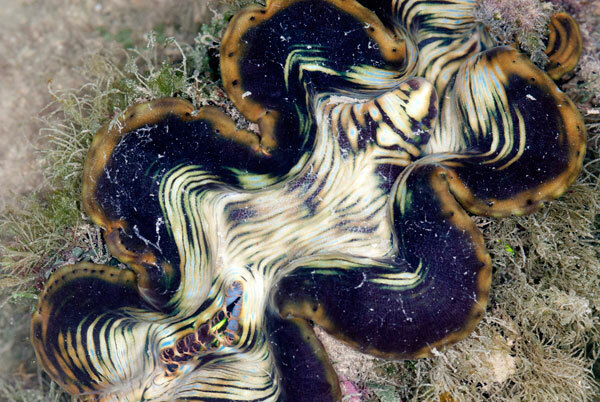 Other special finds included a Fluted giant clam (Tridacna squamosa), which Mei Lin was surprised as she said that the tracked Giant clam had already be relocated elsewhere. 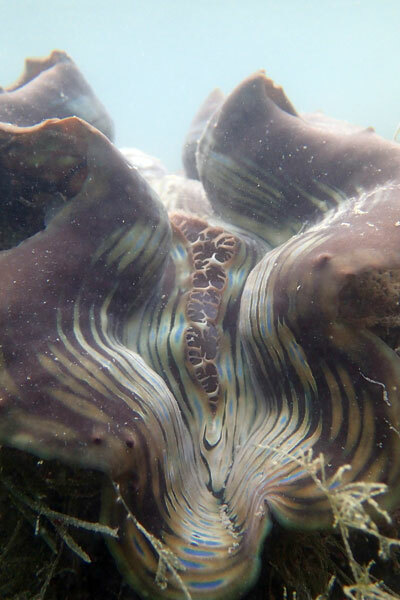 This new found Giant clam was quite some distance away from the tracking marker. I wonder how it got away unnoticed when we frequent this lagoon the most number of times in a year. 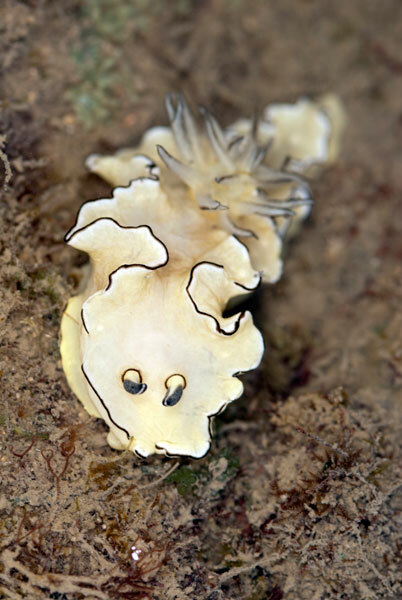 Mei Lin spotted a cute tiny Spotted-tail frogfish (Lophiocharon trisignatus), or rather, the frogfish appeared to her. It was a very active frogfish and it took quite some time to settle down nicely on the sandy substrate for us to photograph. 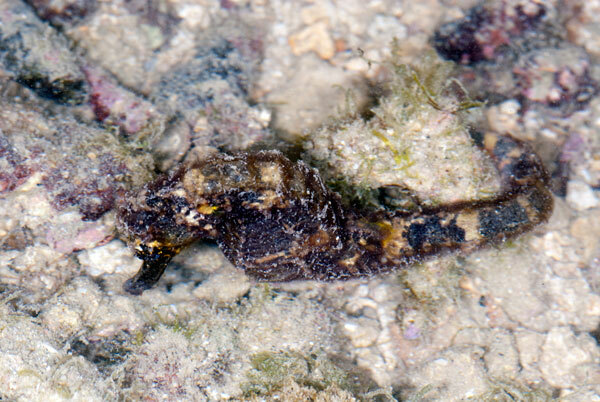 Nearby the frogfish, there was a Spider conch (Lambis lambis) and I caught a video of it trying to flip itself around and moving away. 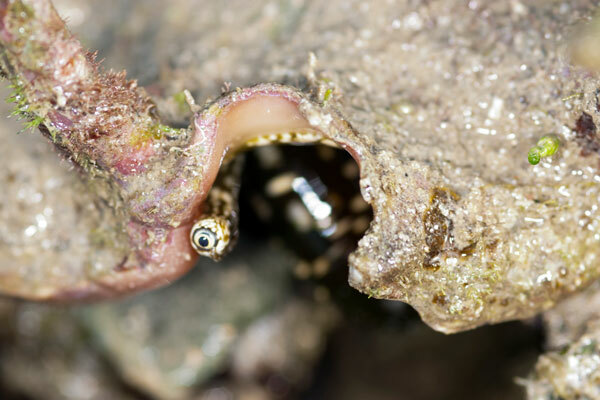 Closeup overview of the Spider conch, with its eye out. 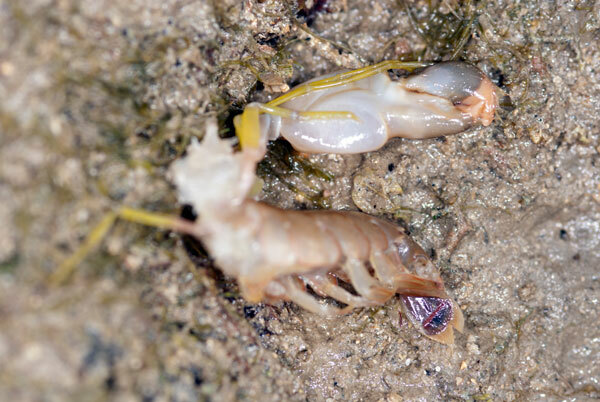 Oh no, this poor Smooth snapping shrimp (Alpheus sp.) has be decapitated. I wonder what happened to the shrimp? Today I had some time to venture along the seawall outside the lagoon and I found a Sally-light-foot crab (Grapsus albolineatus). It is my first time seeing this crab. 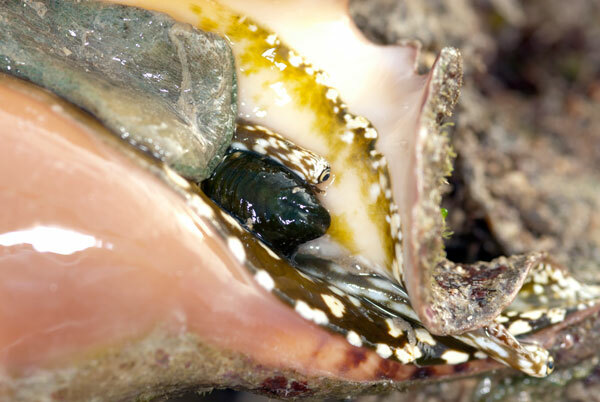 The crab lays close to the surface and stays motionless. 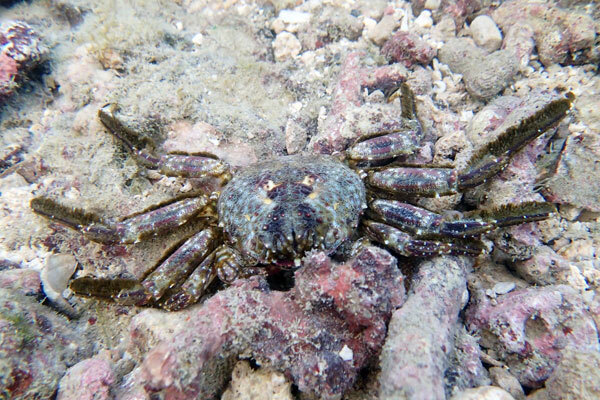 It is not easy to spot the crab as does blend in well into its surroundings. Towards the end of the trip, I managed to located one of the seahorse again. With the help of the sunlight and incoming tide, I took another video of the seahorse. 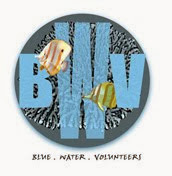 It was a great trip at Big Sisters despite having been here a few times. Every trip brings new surprises and excitements. 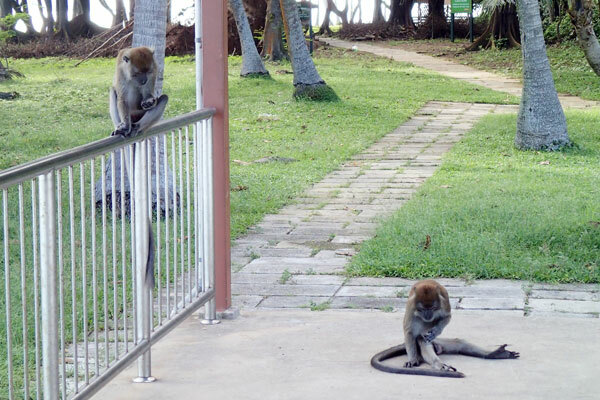 Ending of the trip, the male long-tail macaques joined the team at the jetty, threatening to take our belongings. 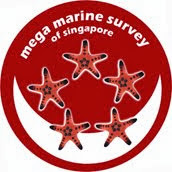 You can check out my YouTube channel for more other videos of Singapore's Biodiversity. I'm slowly building up the videos in my channel.